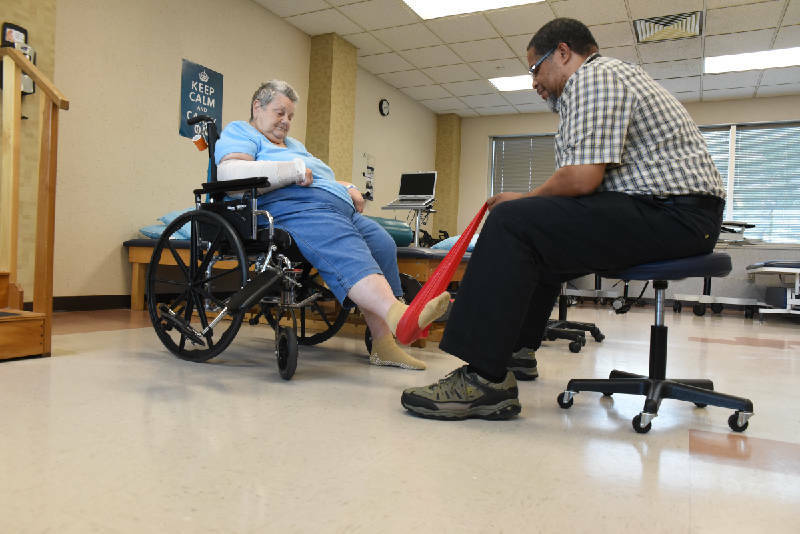 Mary Bradshaw receives assistance from Siskin 28-year veteran Physical Therapy Assistant Stephen Gilchrist during an afternoon workout in the therapy gym. Bradshaw has suffered several recent, disabling falls. * One out of five falls causes a serious injury such as broken bones or a head injury. * Each year, 2.5 million older people are treated in emergency departments for fall injuries. * Over 700,000 patients a year are hospitalized because of a fall injury, most often because of a head injury or hip fracture. * One-third of Americans 65 and older fall each year. * Every 13 seconds, an older adult is treated in the emergency room for a fall; every 20 minutes, an older adult dies from a fall. * More than 95 percent of hip fractures are caused by falling, usually by falling sideways. › Falls are the most common cause of traumatic brain injuries. * Adjusted for inflation, the direct medical costs for fall injuries are $34 billion annually. Hospital costs account for two-thirds of the total. Mary Bradshaw remembers vividly the first time she fell. She was in Costco, she says, standing near a woman who was handing out food samples, when things began to go black. "I started screaming and scared the bejeebers out of her," Bradshaw remembers, sitting in her room at the Siskin Hospital for Physical Rehabilitation. "When I came to, I had seven Costco bosses standing over me." And after Costco, the falls kept coming. "I fell one week five times," she says. "I fell so many times that I told the paramedic EMTs, 'We're gonna be best friends' because the same ones kept coming out to pick me up." Bradshaw, who's in her late 70s, can smile when remembering that encounter, but tears form when she talks about her frustration with her inability to stand. When she last fell, she slammed against her bathtub so hard she fractured her arm and knee — and ended up at Siskin, where she has been struggling in rehab therapy. "[The therapist] had me stand on a four-prong walker, but I had to tell him I couldn't do it any more," she says. "I was afraid I was going to fall." Falls can be fatal for the elderly. In Hamilton County, 19 adults died in 2012 as a result of a fall, according to Carleen Angwin, public health educator with the Chattanooga-Hamilton County Health Department. Of 6,115 emergency room visits at CHI Memorial Hospital in the past year related to falls, 3,486 were people 65 years old or older, or about 57 percent, statistics show. But falls don't just result in broken bones. There is also psychological damage that can be just as debilitating as a broken hip. "It makes them afraid to do some of the things they need to do because they are afraid they might fall," says Dr. Jeffrey Visser, an emergency room doctor at CHI Memorial. "Just daily activities around the house, things like getting into the shower or tub, or getting up and cooking food, or getting up from the lounge chair to go to the dinner table. It affects them psychologically, in terms of no longer being comfortable in their home environment." Some seniors try to cope by denying they have a problem, which ironically can make them more vulnerable to falls. "The fear of having a stigma, of not looking as physically capable as they once did is definitely an issue," says Amy Burba, an occupational therapist and director of outpatient services at Siskin. "When you fall once, it can become a vicious cycle. People tend to become less assertive, more fearful, and that may cause you to fall." * As we age, our sense of balance fades. "There's a general loss of the cerebellum in your brain, which is what controls coordination," Visser explains. "Your reflexes are slower, your ability to react and respond to walking on an uneven surface is going to be slowed or delayed, and that will put you at risk." * Our eyesight fades, and that affects balance. We don't see contrasts as clearly and that affects our ability to see stairs, for example, Burba says. * Medications may make us drowsy. "The more medications you take, the more likely they are to affect your mobility," Visser says. But there are things seniors can do to make it less likely that they will fall. The most important is physical activity. "Any kind of physical activity lowers your risk of a fall," Burba says. Visser agrees: "One of the best exercises you can do is just walking on flat ground to keep your knees and hips in shape." * Turn up the lights so you can see obstacles more clearly. * Get rid of hazards such as rugs that slide on a floor or electrical cords that cross a walkway. * Install handrails in bathrooms, where the chance of falling is greater because of slippery floors. * If your medications make you drowsy, review them with your doctor to see if the dosage can be lowered. Burba also recommends classes for seniors that help them prevent falls by learning problem solving. "If you are going out, plan your route, think about whether there will be a handrail on the stairs, for example," she says. Don't take unnecessary risks, she says, but also don't retreat into your comfy chair. "There's got to be something between giving up," she says, "and taking risks that are not appropriate for your physical level." Contact Times Free Press healthcare reporter Steve Johnson at sjohnson@timesfreepress.com or at 423-757-6673. 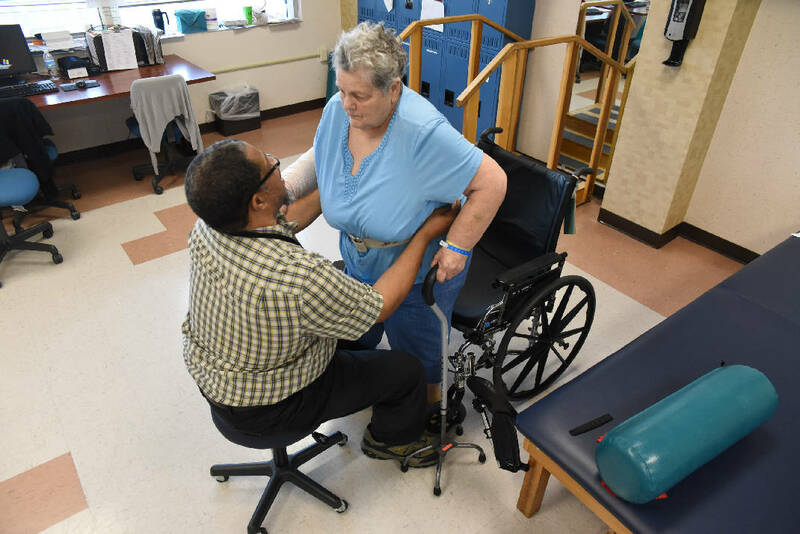 Mary Bradshaw receives assistance from Siskin 28-year veteran Physical Therapy Assistant Stephen Gilchrist during an afternoon workout in the therapy gym. Bradshaw has suffered from several recent, disabling falls.